If you’re a regular reader of BestLeather, you’ve probably started to form an appreciation for well made products. Admittedly though, sometimes the products and pricing can be intimidating. If you’re looking to dabble in the world of fine leather goods, a belt is a great way to start. W.H. 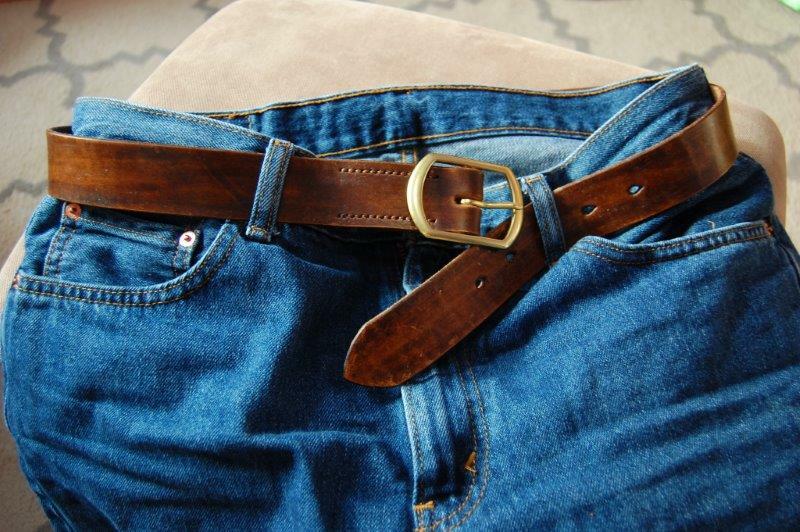 Earl Dry Goods Walnut Belt would be a good start. W.H. Earl Dry Goods is a one man operation run by Nathan Hamm. Based in Portland Oregon, all his products are handmade and he offers a variety of wallets, belts, cardholders and more. The name W.H. Earl is a nod to Nathan’s family history as W.H. Earl was an artilleryman in the Civil War who later ran a general store. Using only the best materials available, W.H. Earl Dry Goods goal is to provide functional, durable products that will last for years to come. The belt we reviewed was the Walnut Belt. It is comprised of one long strip of Hermann Oak vegetable tanned leather. The belt gets its signature look from actually being stained with dye made from black walnut hulls. The hardware used is solid brass and is sturdily kept in place by Ritza Tiger thread. You have the W.H. Earl branding on the interior below the buckle. The belt is 1.5” wide and has teardrop holes which are especially useful for reducing “buckle bulge.” W.H. Earl also has other options for the buckle finish and thread color for really personalizing your belt. The life of a belt is a simple one, and the Walnut Belt delivers. The leather is treated with a wax finish that gives protection against moisture and abrasion, but I find the best benefit of that smooth finish is that it is incredibly easy to get through my jean belt loops. The holes are spaced 1.25” apart and I was able to find that sweet spot of being tight but not too tight. The belt is stout enough that I can throw on my knife, keys or other belt mounted essentials with confidence. The Walnut belt has a rugged and adventurous vibe to it. The walnut dyes really gives character to the grain. It’s not uncommon to feel the sudden urge to chop wood or search for Atlantis when putting this belt on. I find this belt pairs particularly well with denim jeans. The brass buckle looks great and really adds to the overall look. The W.H. Earl Walnut Belt is a solid investment. It’s a triple threat being rugged, well made and quite handsome. At $80 dollars, its affordable and you’re supporting American craftsmanship. So if you’re looking for a belt as manly as you, I’d recommend checking it out.